“The Well Fair,” Elmgreen & Dragset’s first exhibition in China and largest in Asia to date, transforms UCCA’s Great Hall into a fictional art fair by dividing the museum’s signature gallery into evenly spaced rectangular booths. Michael Elmgreen (born 1961 in Copenhagen, Denmark) & Ingar Dragset (born 1969 in Trondheim, Norway) have worked together as an artist duo since 1995. 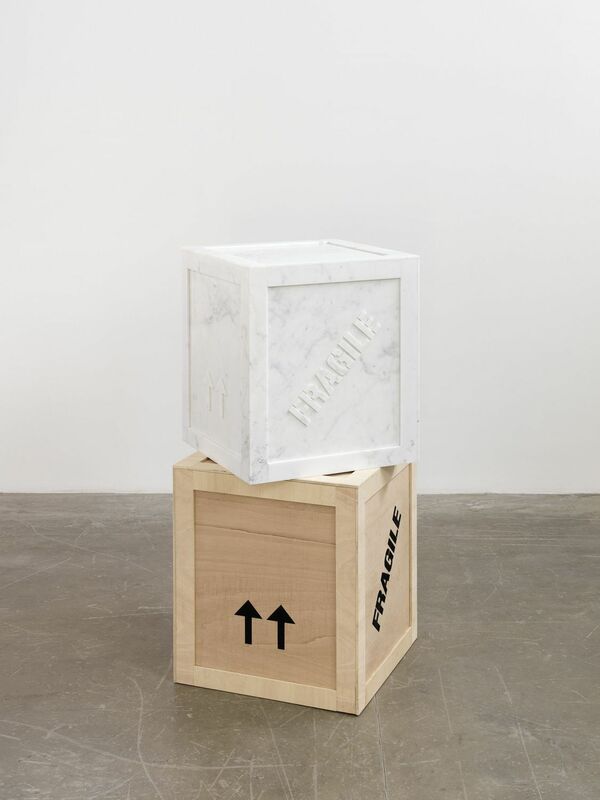 Here, a selection of over 80 Elmgreen & Dragset works created over the past twenty years are displayed in unorthodox ways—crated, wrapped, half-installed, or leaned against the walls, as if the “fair” has either just ended or not yet begun. The temporary, repetitive wall structures arranged in a fishbone grid in the middle of the room, together with the bright, suspended lighting fixtures, are instantly recognizable as the homogenous architecture of commercial art fairs worldwide. The installation also includes a VIP lounge, a cafe area, a reception desk, an auction house area, and a publications section. As a further performative element, museum personnel, including security guards and receptionists, are engaged to act as the fair’s staff. “The Well Fair” continues the duo’s ongoing questioning of institutional structures, conventions, and practices by merging one familiar space with another. Their meticulously tailored architectural installations combine new pieces in dialogue with existing works, recontextualized in new settings. Previous museum shows have taken the form of a failed architect’s apartment (“Tomorrow,” Victoria and Albert Museum, London, 2013) and a generic airport terminal (“Aéroport Mille Plateaux,” Plateau, Samsung Museum of Art, Seoul, 2015). For this exhibition, the intentional disarray of finished pieces inside inherently temporary “booths” evokes the process of a rehearsal and questions the idea of the sublime work of art. The exhibition title recalls “The Welfare Show,” Elmgreen & Dragset’s 2006 exhibition at the Serpentine Gallery, London (among other venues), and contrasts the opposed, yet parallel functions of a commercial art fair and a museum. By constructing an art fair inside a museum, Elmgreen & Dragset investigate the desires that lie beneath the global urge to consume contemporary art and the spatial settings that define the art market.